I decided I was going to attend The Ohio State University when I was in the third grade. I was nine years old, standing in my kitchen, clutching the USA Synchro magazine in my hand, and told my parents that is where I was going to college. Ohio State’s synchronized swimming team had come in second at collegiate nationals that year, and that was my sole reason for wanting to go to Ohio State. I worked for the rest of my elementary, middle, and high school career and synchro career gearing up to swim at Ohio State. I would dream about swimming in the McCorkle Aquatic Pavilion, my mom coming down for all my meets, becoming friends with all the girls on the team, and swimming amazing routines with beautiful suits. Sorry Libby. You were really close, but you didn’t make the team. My entire life had been about swimming for Ohio State. I didn’t know what I was going to do. I didn’t want to transfer, because I had already made friends and connections to the campus. It would be too sad to leave, so I made the best of my situation. I decided to get involved in other activities. I kept in touch with the synchro team and for the rest of my freshman year I was the team’s manager. They welcomed me with open arms and made me feel like part of the group. I stayed in Columbus over winter break and helped with winter training and traveled with them. After winter break I went through formal recruitment through Sorority and Fraternity Life and joined my home away from home, Delta Delta Delta. They quickly became my best friends and truly my sisters. I joined University Choir where we performed in two concerts on campus. In my second year, I went on my first Buck-I-Serv trip to Biloxi, MS, where we helped those who had been affected by Hurricane Katrina. In May Term at the end of my second year, I studied the History, Culture, and Politics of Great Britain in London, England with an amazing group of Ohio State students. In my third year, I went on my second Buck-I-Serv trip to Costa Rica, where we helped build a road and cleaned up a beach. During both my sophomore and junior years, I participated in BuckeyeThon to help raise money for Nationwide Children’s Hospital. I have also served as a recruitment guide for formal recruitment and helped 75 first- and second-year students find their homes. I also started working at the RPAC teaching swim lessons, which brought me back to the pool I thought I was going to spend many hours in. My college career has been nothing like nine-year-old Libby imagined it to be, but I have loved every second of what it has become. I want everyone out there who worries that college is not going to be how they imagine to know that will not be; it’s going to be even better. No matter what experience comes your way, go with it and see where it takes you–it might become the most amazing adventure of your life. One of the most easily confused and under-utilized resources on campus is the Student Wellness Center, on the main floor of the RPAC. This center may seem small from the outside, but it houses many offices, countless resources and is supported by over 200 peer volunteers. I sat down with Blake Marble, one of the assistant directors, and Todd Gibbs, the Wellness Coaching program coordinator, to learn more about what the Student Wellness Center has to offer and why students should access its many resources. For those who are unfamiliar with the Student Wellness Center, can you explain what exactly this center is and does for students? Blake: “The Student Wellness Center works to educate students about wellness topics and wellness issues. We focus on education, prevention and raising awareness. We are oftentimes confused with Student Health Services. We don’t provide any clinical, medical care or anything like that; we focus on the education piece. What are the most common reasons students visit the Student Wellness Center? 1. One is for the excellent one-on-one services we provide students, the personal one-on-one conversation. 2. (Another reason) is for our workshops and presentations; we give over 150 educational workshops each semester. What kinds of programs do student volunteers help with? Blake: “Every single one of (these programs) has a peer education component to them. We have students who are trained to facilitate all of those one-on-one conversations with students. Students are also involved in giving those presentations to a variety of groups and organizations across campus. What are your numbers of students and staff? *Interested students who have a passion for helping others can become trained volunteers at the Wellness Center. Often, students in Fisher who desire to one day become financial advisors get involved in Scarlet And Grey Financial Services, and many Public Health students look to become Wellness Coaches. However, the Wellness Center eagerly accepts students from any background or major! If you have a passion for helping others, consider the incredible opportunity! Interested in getting involved? Get started here! What resources does the Student Wellness Center offer that more students should utilize? Are there any new programs students should know about? *The Wellness Center partners with all student life programs including CCS, Student Health Services, refer back and forth based on how to best meet the needs of the students coming in. What are some common challenges students face in their first year? Blake: “I immediately think about the transition from high school to college. But with that come many challenges relating to personal wellbeing or personal wellness. Some of the things that I automatically think of are stress and time management, and these things affect your emotional wellness and stuff like that. There are so many changes and decisions your first year that it comes down to prioritizing the things in your life and not letting it overwhelm you at times. What would you say to a student who’s going through some of those transitional issues and is perhaps hesitant about addressing those problems? What would you say is the program area that students access the most? For students who may be apprehensive about asking for help, how can they take that first step? What else would you like first-year students to know? Appointments: After you reach out to make an appointment, most appointments are 45 minutes to an hour long. Nutrition Coaching, Financial Coaching… but what really is Wellness Coaching? Wellness Coaching is one of many services available through the Wellness Center. However, Wellness Coaching specifically focuses on the nine different dimensions of wellness using a strengths-based model. Counseling: Uses medical model: diagnose the problem then treat it. What are the top wellness areas (out of the nine dimensions of wellness) that students seek help through wellness coaching? Q: Why do students typically face emotional wellness concerns? A: Stresses of finding a major or making life decisions. Welcome to The Ohio State University and to a new language of acronyms and idioms unique to our campus. Hang on to your snapback, flat-bill hats because we’re in for a roller coaster of a lesson here, folks! 1. RPAC (Recreation and Physical Activities Center): Next door to the Ohio Stadium is the largest collegiate recreation center in the nation. In my opinion, the RPAC is one of the most beautiful buildings on campus, especially at night when the famous “Scarlet Skyway” is lit up for all to see. 2. JO (Jesse Owens Recreational Center): In addition to the RPAC, our campus is also home to three smaller recreational facilities on north, south and West Campus. Named after our famous Buckeye alumnus and former Olympian, Jesse Owens, you can find one of these facilities within a two minute walk from any residence hall! 3. ARC (Adventure Recreation Center): This recreation facility on West Campus offers two indoor turf fields where students can play indoor intramural sports in the winter months. The ARC also houses the OAC (Outdoor Adventure Center) and its a 35-foot rock climbing wall. 4. CABS (Campus Area Bus Service): Need to get to class in Ohio’s unpredictable weather? No problem! Hop on a CABS bus and it will take you to major locations around campus. 5. COTA (Central Ohio Transit Authority): You bought a ticket to a concert at Nationwide Arena, but you don’t have a car. That’s okay! 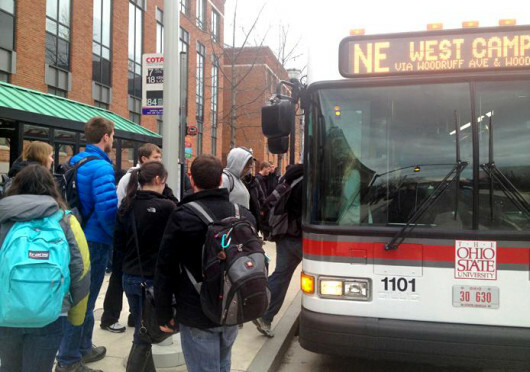 Hop on a COTA bus with your BuckID and explore Columbus; the service is already included in your student fees! 6. NoCo (North Commons): Found in the center of the north campus residence halls, NoCo is a traditional all-you-care-to-eat dining location; on Wednesday nights — “Pasta Night” — you can forge strong friendships over a plate of pasta and chicken tenders. 7. KCom (Kennedy Commons): For all of you south campus dwellers, KCom is where you will find nearby buffet-style, all-you-care-to-eat dining. Check out their steak night or their breakfast options available all day! 8. KSA Cafe (Knowlton School of Architecture Cafe): Although not as large as NoCo or KCom, this hidden dining location provides lunch options and hot breakfast sandwiches all day for those who want a good meal between classes. 9. CSLS (Center for Student Leadership and Service): The CSLS might become your second home if you’re looking to get involved on campus. The CSLS offers office space in the Ohio Union for over 60 student organizations and is also home to the resource room, where you can always find a friendly face ready to help. 10. CFAES (College of Food, Agriculture and Environmental Sciences): Our university was founded in 1870 as Ohio Agricultural and Mechanical College, and Ohio State continues to have a strong focus on agriculture as it leads the way as Ohio’s largest industry. Visit CFAES on West Campus. 11. RA (Resident Advisor): These students build community on your floor by planning fun events while also supporting residence hall policies. Become friends with them! 12. OA (Office Assistant): Need an on-campus job? Great! OAs work at the front desk of each building and handle the mail and equipment that can be checked out by students. It’s a great way to earn some money without leaving your building! 13. The Shoe (Ohio Stadium): After construction is completed this August, this monument to football is expected to seat over 107,000 Buckeye fans. 14. Beekman (Fred Beekman Park): Found on West Campus, this outdoor recreation area provides space for students to enjoy baseball, softball, flag football and sand volleyball. 15. TTUN (That Team Up North): On the Ohio State campus, it’s best that you never refer to *ichigan by its actual name. I mean, who would root for a team that plays like this? 16. TBDBITL (The Best Damn Band In The Land): You now go to a school where the crowd cheers as loud for the band as they do for a touchdown. Stick around during halftime…you won’t regret it. 17. MCC (Multicultural Center): If you’re looking for a place to connect with people or explore and celebrate different values and beliefs, the MCC (on the first floor of the Ohio Union) is the place for you! 18. Schott (The Schottenstein Center): Cheering on the Buckeyes doesn’t just end when football is over. The Schott is home to the Buckeye basketball teams and the 6th man, also known as the Nut House. 19. GE (General Education curriculum): These are the courses that everyone takes to supplement courses for your major and that contribute to a well-rounded education. 20. YAH (You Are Home): Welcome to the university that will change your life for the better and become your second home. The next years of your life at this place will shape your future in memorable and magnificent ways. Be sure to check in next week as Mady shares 21 Events to Experience on Campus. …read on to hear about three fantastic ways to spend your evening at orientation! The Ohio State University has one of the top Recreation and Physical Activity Centers (RPAC) in the nation. During orientation evening activities, students and their small groups come together as a team to work their way through a series of physical and mental challenges as they explore the RPAC and learn about all this facility has to offer. There truly is something for everyone at the RPAC Challenge and even fun prizes for the winning team! Don’t miss out on the chance to help your team bring home a victory! Those bragging rights will last well into fall semester! Do you like to laugh? Do you enjoy comedy and improvisation? Then Orientation Night Live (ONL) is the show for you! Following the RPAC challenge, students will have the option of attending this crowd pleasing show. ONL is formatted much like the TV show Whose Line Is It Anyway?, and is facilitated by the Orientation Leaders. Watching the OLs act silly on stage is guaranteed to make you laugh harder than you can remember! As a student in the audience, you are given the chance to shout out scene and character suggestions, and are even given the opportunity to get up on stage! Orientation Night Live is a favorite memory for many orientation students, and is one activity you definitely don’t want to miss out on! Darkness has fallen and campus is quiet, but evening activities are going strong with this final opportunity. Following ONL, students are given the option to go on a moonlight tour of the Oval. On the tour (led by the OLs) you will learn many fun and interesting facts about the history and traditions of the university and enjoy the unique atmosphere that is the Oval at night. This tour is the final activity for the evening, and is a great way to wrap up your day one experience! Clearly, evening activities are a blast and will leave you with knowledge, memories and deeper friendships that will last into the school year and beyond. You can guarantee evening activities are a must in order to make the most of your orientation experience! 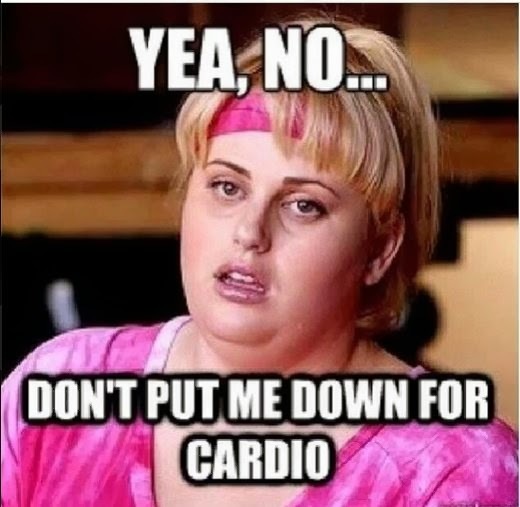 We’ve all come up with excuses at some time or another to avoid going to the gym: I have too much to do, it’s too far away, or it’s too cold out (or, in the case of this semester, there’s still too much snow on the ground!) But in reality, we know this is something important we should do to live a healthy lifestyle. 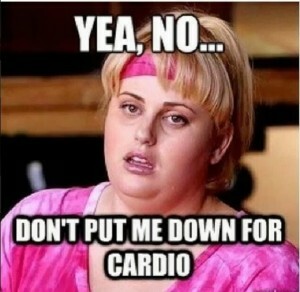 For me, working out has always been a chore. Last year, I viewed it as something I didn’t like to do, but I did it anyway. But this had its flaws. If I was really busy, working out was the first thing that would go. If it was really cold, I wouldn’t make the frigid walk to the RPAC. Here are 5 tips I’ve learned over the past year or so on how I have increased my motivation to work out. Working out with a buddy is a great way to build motivation for a workout. If you and a friend schedule a workout, you’re less likely to back out if you know someone is relying on you to be there. Plus it’s fun! Going to a ZUMBA class or yoga with a friend for the first time can be a fun way to let loose! Finding an activity you enjoy makes working out fun! Running on the treadmill every day can get repititive, so try a variety of things–maybe it’s a pickup game of basketball, or a night of rock-climbing. Trying new activities is a great way to spice things up a bit. If you set a goal in your workout plan, you will feel like you’re working toward something. Maybe it’s running two more laps around the track next time, or increasing the weights you lift. Or maybe it’s scoring a few more goals in your intramural soccer game! Whatever it is, setting a goal helps you feel productive. Understanding the benefits of exercising also helps with the motivation of actually doing it. Now that we’re (hopefully) coming out of the snowy, gloomy winter of central Ohio, the weather is getting nicer and we can spend more time outside. But when it’s cold and gloomy, we lack the vitamin D we get from the sun, which can sometimes affect our moods. By exercising regularly, you release serotonin which helps make you happier! I am no expert on health and medicine, but I’ve noticed when I work out regularly, I’m happier, more productive, and feel better in general. Check out the Student Wellness Center for more benefits and information. Committing to yourself is half the battle! By scheduling workout times into your weekly schedule, you’ll be prepared for your hectic day. If you know you have a busy couple of days, schedule a workout time so you can prepare to bring your clothes and tennis shoes with you for the day. This way, you’ll be ready to go!